����� ��� ������, ���� �� �����… ��� ���, ��� ����� ���. This entry was posted in General on January 30, 2002 by Dotan Dimet. NewsIsFree is a very cool looking idea, a site that collects RSS feeds and makes them available in an nice format, with a much more pleasant interface than Meerkat or the Userland RSS aggregator. Its also has options to blog stories using Blogger, Manila &amp; Radio. Synergy, man. This entry was posted in General on January 29, 2002 by Dotan Dimet. Ori Folger (someone reads my blog! hi!) prefers XNView (“another excellent, free graphics tool“) to Irfanview. It looks good. 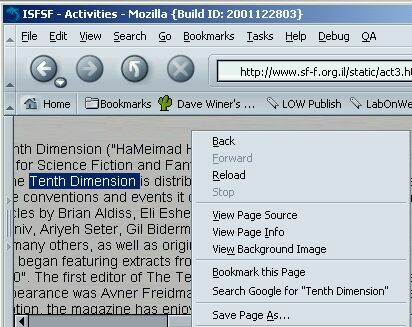 He also notes that Opera has had the feature I noticed in Mozilla yesterday “for a while now”. I can’t see it in Opera 5, maybe it’s in Opera 6. Opera 5 does have a “search with google” panel at the top of each window frame, which is nearly as convenient and more flexible (in Mozilla, you’ve got that in the location bar). The most beautiful feature I saw in Opera was the presentation mode. “Beautiful” here means elegant, simple and cool: it let’s you define a presentation (like Powerpoint) by setting style rules that Opera applies while in full-screen mode. This lets you write a whole set of “slides” in HTML in a single document, and keep the lecture notes and the slides together. Folger says “Open Source is imitative, rather than innovative”; this is one feature that I’d like to see Mozilla imitate. This entry was posted in General on January 28, 2002 by Dotan Dimet. Also, IrfanView rocks. Starts up much faster than Photoshop, supports more file formats than MS Paint, it’s just perfect for pasting screen captures, cropping them, and saving them in the file format of your choice. This entry was posted in General, short on January 27, 2002 by Dotan Dimet. Notice that there’s an entry in the context menu to search Google for the highlighted word; that’s my favorite bookmarklet slotted directly into the browser. This entry was posted in General on January 27, 2002 by Dotan Dimet.